The race circuit was founded as Österreichring and hosted the Austrian Grand Prix for 18 consecutive years, from 1970 to 1987. It was later shortened, rebuilt and renamed the A1-Ring (A Eins-Ring), and it hosted the Austrian Grand Prix again from 1997 to 2003. When Formula One outgrew the circuit, a plan was drawn up to extend the layout. Parts of the circuit, including the pits and main grandstand, were demolished, but construction work was stopped and the circuit remained unusable for several years before it was purchased by Red Bull's Dietrich Mateschitz and rebuilt. Renamed the Red Bull Ring the track was reopened on 15 May 2011 and subsequently hosted a round of the 2011 DTM season and a round of the 2011 F2 championship. Formula One returned to the circuit in the 2014 season. "At Zeltweg, down the long straight to the Bosch Kurve, the car was throwing out 1400 bhp and just kept on pushing – you felt like you were sitting on a rocket." Gerhard Berger (speaking in 2007) on the turbocharged Benetton-BMW he drove in F1 during 1986. 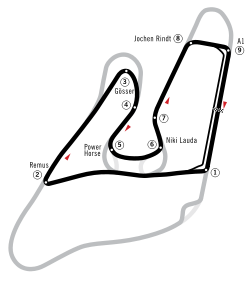 Österreichring track layout from 1977 to 1995, with Hella-Licht chicane. 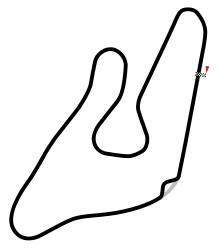 The corner lined in gray, "Vost-Hugel", was used on the circuit's original configuration from 1969 to 1976. Originally built in 1969 to replace the bland and bumpy Zeltweg Airfield circuit, the Österreichring track was situated in the Styrian mountains and it was a spectacular, scenic and unique circuit. The track was very fast, every corner was a fast sweeper and was taken in no lower than 3rd gear in a 5-speed gearbox and 4th in a 6-speed gearbox and the track had noticeable changes in elevation during the course of a lap, 65 metres from lowest to highest point. Like most fast circuits it was a hard circuit on engines but more difficult on tires, because of the speeds being so consistently high. Many considered the Österreichring to be dangerous, especially the Bosch Kurve, a 180-degree downhill right-hand corner with almost no run-off area which, by 1986 when turbos pushed Formula One engine power to upwards of 1,400 bhp (1,044 kW; 1,419 PS) in qualifying, saw Derek Warwick speed trapped at 344 km/h (214 mph) in his BMW powered Brabham BT55 on the run to the Bosch Kurve. There were other testing corners such as Voest-Hugel, which was a flat-out 180 mph right hander that eventually led to the 150 mph Sebring-Auspuff Kurve (this corner had many names over the years, Dr. Tiroch and Glatz Kurve were others) which was an essential corner to get right because of the long straight afterwards that led to the Bosch Kurve. Some of the track was just road with little to no protection at all, even up to the final Austrian Grand Prix there in 1987, a race that had to be restarted twice because of 2 progressively more serious accidents both caused by the narrow pit straight in a similar manner to the 1985 race when the race was stopped after one lap following a start line shunt that had taken out three cars including championship leader Michele Alboreto's Ferrari and local driver Gerhard Berger's Arrows-BMW. In practice for the 1987 race McLaren's Stefan Johansson narrowly avoided serious injury or worse when at over 150 mph he collided with a deer that had made its way onto the track while Johansson was cresting a blind brow before the Jochen Rindt Kurve behind the pits. Increasing speeds were also a concern at the Österreichring; during the final Grand Prix there in 1987 pole-sitter Nelson Piquet's time for the 5.942 km (3.692 mi) of 1:23.357 set an average speed record for the circuit of 159.457 mph (255.756 km/h). At the time it was second only in F1 average speed to Keke Rosberg's 160.9 mph (258.9 km/h) pole lap of the Silverstone Circuit set during the 1985 British Grand Prix. Both times were set using a turbocharged Williams-Honda. American driver Mark Donohue died after crashing at the Vost-Hugel Kurve in 1975. In 1976, the Vost-Hugel Kurve was tightened and made into one right hander rather than 2 right-handers with a small section between, and in 1977 it was slowed down and became the Hella-Licht chicane, going from the fastest to the slowest corner on the track. It is also known that four-times World Champion Alain Prost often said that all tracks can be changed but that the Österreichring should remain unchanged, just adding run-off areas would be fine, which eventually did happen up until the original track's final year in 1995. The track was known for having many crashes at the start of races (especially 6-foot-wide [1.8 m] Formula One cars at the Austrian Grand Prix) because the start–finish straight was very narrow (about 30 feet wide [9.1 m], while most start–finish straights on other tracks were 60 to 80 feet wide [18 to 24 m]) and it did not provide enough space for cars attempting to pass others, especially cars that stalled or broke at the start. Motorcycle rider Hans-Peter Klampfer died after a collision with another rider at the Bosch Kurve (where most fatalities happened) and 29-year-old Hannes Wustinger was also killed after a crash at the Tiroch Kurve (the part that was left out of the present circuit) at a race for the Austrian Touring car championship and this sealed the decision to build a new circuit. Triple World Champion and long time hero of the home crowd Niki Lauda is the only Austrian driver to win his home Grand Prix. He won the 1984 Austrian Grand Prix at the Österreichring driving a McLaren-TAG Porsche. Lauda went on to win his third and final championship in 1984, beating his team mate Alain Prost by the smallest margin in F1 history, only half a point. He announced his permanent retirement from driving at the circuit before the 1985 race. The Österreichring's safety concerns had reached a head in the mid 1990s, and in 1995 and 1996 it was totally rebuilt, at the same site, by Hermann Tilke. Its length was shortened from 5.942 km (3.692 mi) to 4.326 km (2.688 mi), and the fast sweeping corners were replaced by three tight right-handers, in order to create overtaking opportunities. Its three long straights, as well as a twisty infield section, asked for a setup compromise. As much of the construction work was paid for by the mobile phone provider A1, the track was renamed the A1-Ring. It proceeded to host seven Formula One Austrian Grands Prix between 1997 and 2003, as well as several DTM races and Austrian motorcycle races in 1996 and 1997. The grandstands and pit buildings were demolished in 2004, rendering the track unusable for any motorsport category. In late 2004 and early 2005, there were intense discussions concerning whether the owner of the circuit, Red Bull, would find another use for the site, or return motor sports to the venue. There was a circuit extension proposal using part of the old Österreichring. In January 2005, return of motor sports seemed more unlikely than ever, as Dietrich Mateschitz publicly announced that he had no intention of wasting money on a deficient circuit. Throughout 2005 however, there was speculation of the newly founded Red Bull Racing renovating the track to use it as a test venue. In 2006, Austrian racing driver Alexander Wurz claimed he would buy the circuit and have it renovated, but the idea never came to fruition. By 2007, talks involving Red Bull, KTM, Volkswagen and Magna International for a neuer Österreichring failed, after VW pulled out. Late in 2008, Red Bull began their €70m reconstruction of the track and DTM chiefs considered a return to the circuit in 2009, and in September 2010, it was confirmed that the circuit would host a round of the 2011 DTM season, now known as the Red Bull Ring. The championship has visited the circuit every year since then. In November 2010, F2 announced that Round 6 of the 2011 F2 championship would take place at the Red Bull Ring. The circuit was reopened at a special event over the weekend of 15–16 May 2011, which included displays of various Red Bull sponsored teams including Red Bull Racing. The FIA Historic Formula One Championship was invited to provide the headline race attraction with a race on each day for Formula One cars from the 3-litre period. In December 2012, Red Bull contacted the FIA to say the track would be available to host a round of the Formula One World Championship in 2013, after a slot became available following the postponement of the proposed New York metropolitan area Grand Prix of America, and by July 2013, Red Bull announced that the Austrian Grand Prix would return as a round of the Formula One World Championship in 2014. The Austrian Grand Prix was held on 22 June 2014. From 2014, the track also hosted a round of the Red Bull Air Race World Championship. On February 11, 2016, it was announced that MotoGP would return to the circuit in 2016 for the first time since 1997. The lap records at the Red Bull Ring. ^ "NeroGiardini Motorrad Grand Prix von Österreich – Circuit information: Red Bull Ring – Spielberg" (PDF). MotoGP.com. Dorna Sports. 11 August 2016. Retrieved 12 August 2016. ^ van de Burgt, Andrew, ed. (December 2007). "Photo Finish: The Story Behind the Picture – 1986: Austrian Grand Prix". Autosport. Vol. 190 no. 12. p. 102. ^ "Red Bull offers own track for Austrian GP return in 2013". bbc.co.uk. BBC. 9 December 2012. Retrieved 11 December 2012. ^ "2016 MotoGP™ Calendar confirmed". MotoGP.com. Dorna Sports. 11 February 2016. Retrieved 30 June 2016. Wikimedia Commons has media related to Red Bull Ring, Österreichring and A1 Ring Circuit.